I’m honoured to have received an Individual Arts Grant from the Government of Flanders for a one-year period in 2018-2019. This is a scholarship specifically aimed at giving an artist the necessary time and space to deepen and broaden his or her practice as a whole, with contemplation and reflection at its core. It’s nigh impossible to buy time to step back and reflect nowadays, and few grants make this possible… this is one of them. Allowing me to breathe, critique, and move forward in a meaningful way. Thank you for that. 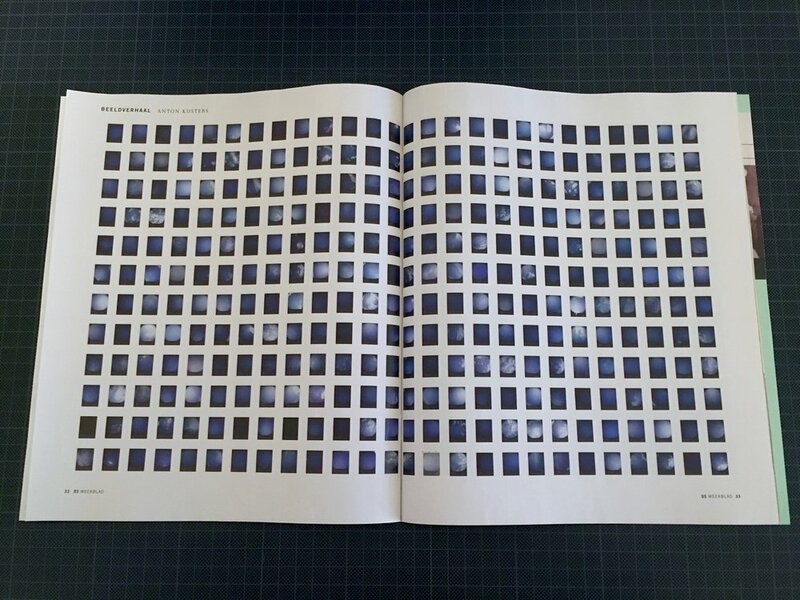 The Blue Skies Project in De Standaard "dS Weekblad"
A beautiful publication with all 1,078 images reproduced of The Blue Skies Project. In the weekend magazine “dS Weekblad” from De Standaard. Recently I did an informal talk at my friend Evelien’s place in Amsterdam. She organised everything and hosted at her place with Po, cat extraordinaire. 8 friends at the table, cooking and having dinner together, and afterwards one of us talks about his work. I had mentioned before to her how I missed being able to talk to friends about what I’m currently doing, what thoughts are going on in my head, the projects I’m tackling behind the scenes, the way I try to stay afloat financially, how to produce my own work, what scares me, what makes me confident, if the ideas I’m having are actually good or not. You know, things you normally only reserve for your inner circle, if even that. It's cool to appear confident after all. Renate was going to cook Bombay Eggs for dinner, and we decided to name the event “Eggs & Photos”. The condition would be that always at least one dish should have eggs as an ingredient., and that the friend-speaker should have prepared a three hour talk at the minimum (just to mess with their minds). The concept was born. I’ve written before about having a group of people that are instrumental to me being able to gauge different aspects of my work or my process, but now I got the chance to talk about everything all at once to everyone all at once. Basically an unedited look behind the scenes into the running engine that is my mind. It was different than any talk I’ve ever given. So much better and more liberating. I can’t say exactly what prompted this, but I ended up laying everything out there, no taboos. About (the lack of) money, securities and insecurities, storytelling, the choice of only making autonomous work, collaborations, cameras, images as objects, books as objects, connecting to people, drinking coffee and what not. The resulting discussions were extremely interesting, professionals friends bouncing off ideas and feeding off of each others feedback. Actual constructive dialogue, as it were. Usually the outside world knows you through your images, your publications, your social media, and to a lesser extent your lectures or workshops. All of which is admittedly a very narrow connection. But now, I could talk about a complete picture of what’s behind all that. It’s one of the most important things I’ve always missed as a professional photographer: constructive professional peer/friend feedback and discussion. I always imagined this to be the core reason why photo collectives existed in the first place, not for the pooling of resources or the collective strength or the brand or the notoriety or whatever, but the open-behind-closed-doors discussion of everyone’s work in every possible stage, from concept to full on production to putting it in the world out there. No taboos, no holds barred. Genuinely people interested in thinking and discussing - with a strong professional background, not necessarily related to photography - with zero alternative agenda. So it turned out, while preparing my massive three hour minimum “tour of what’s inside my head” presentation, that I didn’t even know that I was actively working on 9 substantial projects simultaneously (and a whole lot of concepts of course). Two have already been “put in the world” so to speak (Yakuza & Mono No Aware), but they do need constant working on nonetheless (e.g. I’m working on an exhibit for both of them as we speak). Because my work is autonomous and long-term, whenever a project is put out there (even if you’ve worked on it for years already), it would be considered “just the beginning”. So I’ve come to look at my current projects as my nine lives: if I manage to get each and every one out there in the world, that would be 9 versions of myself out there, each with its own idiosyncrasies, mistakes and imperfections, its own beauty and ugliness, its own successes and failures. But it will be out there, alive and independent, making a mark, and I’ll be proud. The one thing I can’t wait for? To be invited to the next Eggs & Photos, as an audience member this time, to return the huge favour. By the way, his – undoubtedly excellent – new album "Schaduwland" (land of shadows) is set to be released in October. As of now, you can pre-order signed copies of the upcoming third edition of YAKUZA. Great news... as of now, May 1st 2016, the third edition of YAKUZA is available to order. Many of you who missed out on buying the first or second edition, have emailed me throughout the years (yes, it's been *that* long) to please let them know if I'd ever have a chance of printing a third edition... and I've always promised that I'd try hard to make it happen... and here we are. Finally. The design is ready, and the book is scheduled to go in print in two weeks. And I'll be able to ship books starting May 1st. Of course, I'll keep you informed with a printing update along the way... so you won't miss a thing. I'm happy to finally make this book available to a wider audience, and at the same time maintaining respect for all of you who bought the first and second editions (frankly, without you all, I simply wouldn't even be here...). Not so long ago in Berlin. I really, really, really don't know where the series is going yet... but there's something in the images I'd like to explore. I went to Berlin for two weeks, looking to see if a new story – that was playing in my mind – was actually possible. I worked hard setting up everything right, and friends helped me out for many crucial parts. I played over all possible scenarios in my head countless times. And of course reality turned out to be something completely different. We all know this mostly happens, and we all know we must be prepared to adapt at all times. Mind you, I'm not thinking "different" in terms of "better" or "worse". The project just became "different" in se, in every possible way. I eventually ended up asking myself if I should hold on to the story I envisioned, or let the unfolding reality in front of me take me along for the ride? Or could I make both fit together? Were they even that different? A tour de force? I'm now letting everything sink in at home. I'm empty and full at the same time. I hit rock bottom there doubting myself and my abilities. Yet I met amazing people with beautiful stories that I would sooooo like to visualise in the best way I possibly can. Need to. Their stories. The common ground they represent. Pretty vague right now, I know, I know... but I'll come up with a title and a good description as soon as I have just a few more images... Slowly and steady, right? I must say, it feels like I'm on a huge crossroad for this one, constantly being swayed left to right, top to bottom. Love it. Hate it. Continue. Abandon. Move on. Get real. Make better images. But even though all that's happening, I still see something in the imperfect images I already have. So I kind of have nowhere to hide, right? I just need to make many, many, strong images. As if that's the easy part. A few days ago the printer delivered the last boxes of YAKUZA books to my door (I was able to make a deal with him to stock my books – great guy, by the way). To my surprise – pleasant surprise – he only handed me 8 boxes. "That's all that's left, son". The second edition of ODO YAKUZA TOKYO is now sold out. Phew, what a ride for this book... I'll be switching off the online orders in a couple of days, so if you're looking to get a last minute order for this edition, do it NOW. Yes NOW. This is some snow. This is a book at the presses. These are the first dummy tests for the "dislocate" books. This is a good whiskey (after having a few). This is some more work done on the "yakuza" solo exhibit in april. And these are flowers for my mother. ....and there's much more to come. 2013 is going to be a good year, I'm sure of it. For all of us... it has to be. My best wishes to each and every one of you... and see you soon. Hi. I've een working on a first Yakuza exhibit concept. I started out sketching by hand and then taking pictures at the actual location, but constantly going up and down to measure, make new pictures, adjust the sketch, became too time-consuming. The sketches would always lack a sense of proportion: I would e.g. have no idea how large or small an image should be printed to fit a wall in a balanced way, or what would be an ideal viewing distance for any given size. So I forced myself to make time to learn the basics of 3D architectural modeling (I basically downloaded Google SketchUp and watched all the tutorials). It took a long time to get going, and it's quite crude, but as soon as I'd created the room in the right proportions, it became amazing how easy it was to virtually hang images on the walls, put people in the rooms, and see what the impact would be on the space the images were in, make them bigger or smaller, hang them up a little higher, work with different levels,... In a flash, this tool had become indispensable for me to test all my concepts in many more ways than I ever could do before. Another benefit of 3D is being able to show different views. Even though my concept is far from finished, I was able to show the gallery director a walkthrough and the different rooms and basically show whatever she needed to see. She loved it. How do you guys go about sketching an exhibit? So here is the big news... my first YAKUZA solo exhibit has just been confirmed for spring 2013. And it's one hell of a unique location... the former Winterslag coal mine now-converted-to-cool-cultural-centre C-mine... A long time ago, this was also the coal mine my late grandfather and godfather (not Antoine, but Bert) worked in. I now have exactly 11 months to prepare. It seems like a long time, but in reality it's not.... I'll be drawing concepts, making scale models, test prints, paper types, and sketching like hell. And the edit and sequencing of course will be crucial... and the production of the artwork itself will take several months... not to mention producing the installation itself. I think I've got some cool things in mind as to how I'd like to approach this, and the next conversations with C-mine will determine the feasibility of what's inside my head. They loved the initial concept, so hopefully it'll work out the way I'm envisioning it. I'll be talking about every step of the way right here, building the concept online, and letting it grow from idea to sketch to model to reality... a careful deliberate journey, and hopefully mucho fun! I just visited the location, and I've got a whopping 450 m2 (about 1,500 sq ft) at my disposal. On January 27, 1945, Soviet troops liberated the Nazi concentration and death camp Auschwitz-Birkenau in Poland. Today is also the International Day of Commemoration in Memory of the Victims of the Holocaust. Below the poem Todesfuge (Death Fugue) by Paul Celan. A photographer and good friend of mine, Koen, told me about this poem while we were discussing The Blue Skies Project... I had never heard of it... and I thought it fitting for this day today. your ashen hair Shulamith we dig a grave in the breezes there one lies unconfined. Meet my late grandfather, Antoine Libens. Alfons Libens & Jeanne Degros were his parents. But everyone called him Gaston. Gaston is the reason that I 'm starting my next long term project: The Blue Skies Project. The Blue Skies Project will become a personal journey, me trying to make sense of something unimaginable. Something unspeakable. Something that took place in Europe 70 years ago, before I was born. I feel the need to personally understand and place the huge and unimaginable injustice done to so many millions during the years of the Holocaust. A darkest page in human history, yet a page never to be forgotten. It all started with my grandfather during WWII, when he was a geography student at the Catholic University of Louvain, Belgium. One night, when Gaston was home asleep, Nazi soldiers raided the house. In the middle of the night they banged the door and forced their way in. His mother woke up from the noise and pushed him out of bed and out the bedroom window onto the flat roof. The soldiers were on a mission to round up and deport all university students who were member of a certain fraternity, with members active in the resistance. It didn't take long before the soldiers entered Gaston's bedroom. Though it appeared as if the bed was unslept in, one of the soldiers felt the warm mattress and deducted that he must be hiding somewhere in the immediate surroundings. Outside in the meantime, Gaston had been unable to find a hiding place on the flat roof, the only thing in the nearby being a glass dome shaped window in the roof, behind which he desperately tried to tuck himself away as much as he could. One of the young German soldiers, about the same age as him, opened the bedroom window and climbed out onto the roof. It was impossible not to spot my grandfather. And indeed he did. My grandfather peering through the glass, acutely aware that he could as well just be standing up and in plain sight, and the German soldier looking straight back at him. Then It happens. They lock eyes for an instant. Both men in their late teens. Both men black hair. Both men look at each other for an eternity, in which they seem to realize something more, something bigger than that wretched war. The soldier steps back inside saying "Nein, er ist hier nicht."... the cue for my grandfather to make a run for it. Over different roofs, several houses down the road where he jumps off into a courtyard. Unfortunately Gaston jumps straight into a dog pen, waking up the dog who starts to bark loudly. It's about 2am now. Gaston frantically tries to keep the dog quiet, eventually succeeds, and stays in the pen literally for several hours, waiting. Hours later, he climbs out of the pen. As he walks back to his house, at the end of the street around the corner, he suddenly gets pulled into a house by one of his neighbors... a woman suspected to be collaborating with Nazi Germany. She pulls him into her house, whispering "Antoine! Hide here, wait, they're still staking out your house waiting for you to return...". My grandfather's life got saved twice that night. And by two of the most unlikely people to do so. A tiny story of hope in what were the darkest of days for millions. I have no answers. But maybe, just maybe, I could provoke good thought. For years now I've used the concept of a light table for my site. And for me, it stood the test of time. My content was simplified to the max, just one single timeline, and in one glance you could see what was going on with me and my work at any given moment. It even simplified the way I would work in the field: "create the story, Anton, don't think about anything else". But lately I've been struggling to fit in the different types of things that I do within a story, and at the same time the different ways that I'd like to communicate within a story. The site had just one timeline, and therefore just one possibility. I could not hold any attention to things that had to remain out there longer than being the most recent post, and there was no visual difference between "am important post" and "a little b-roll image". I ended up posting farther and farther between, always trying to make a new post at least as important as the previous one.... but that obviously quickly became something of an impossible situation. Now... A New Year, new resolutions, and also time to change this... sorry about the tech talk below, but I need to get this off my chest. I need the possibility to draw attention to things (whatever they are) in a separated-from-the-blog-timeline kind of way. That's all i wish for... plus the usual good SEO, integration of social media (fb, twitter, etc) and a shopping cart. I chose to shop around for the best possible premium theme I could find with a good mix of typography and room for images (the so called "photography themes", while great for images, sadly often neglect the text/typography part). No need to reinvent the wheel... let me focus on the content instead. There are so many amazing themes out there that are a perfect base to start from. I ended up purchasing the Echo theme by Onioneye over on themeforest. Nice and light and I suspect perfectly suited for my needs. I could have (maybe should have?) made a distinction between "pages" and "posts" by adding /blog/ for all posts. But I want blog posts and (timeless) pages to be as important as one another, thus on the same level URL wise, and SEO wise. Enough with all the behind the scenes tech stuff. I guess I just needed to write this to seek your opinions, and to get it out of my head as well... Tell me, what do you think, does the above sound like a good structure to build upon? If you want to show multiple long term projects, talk about each of them along they way, and each yielding different "products" at different times? Yes... I know... I should be concentrating on the thing the REALLY matters... creating new work. But for me, knowing that I have the structure behind my work down, gives me tremendous peace of mind to go out an do what I love. Even if I know that above all, creating new work scares the heck out of me. Standing in front of that fresh empty new canvas, knowing that yes, NOW, I have to deliver. But that's food for thought a next post. In the mean time, my switch to squarespace has rendered this post obsolete. Well, sort of... I still use three "journals" to : a general "news" (me talking about my projects), "appearances" (listing everywhere my projects - and I - appear) and "things" (listing the things I create within any given project, like a book, posters, an exhibit,...) Of course all of these journals are categorized by project whenever needed. It’s been 3 months now since I’ve been home, and I’ve started wondering about some things. Even though I'm full on taking care of the distribution of my ODO YAKUZA TOKYO book and images and having great fun doing it and meeting the press and other super interesting people (more on that one soon), I’m starting to feel the need to slowly get into new projects. Broaden my horizon. Deepen my photography. Read more. Learn more. My great-grandparents, even though I never knew them, are right now in my studio looking at me and telling me I'll be fine, but that I've thought things through long enough now. Time to get to work. Beirut is playing The Rip Tide. It’s a funny state of mind I'm in... I recognize it so clearly from three years ago, when a little voice in the back of my head made me decide to go for the YAKUZA project. Just as YAKUZA was only inside my head then, right now all these new ideas are only inside my head. Some of them nothing more than a feeling; a longing to learn more about something. A deceptively small and fragile thing. A seedling. And the hard part I know will begin right now: to try and shape those little ideas into something tangible, into hopefully that real thing, to take it out of my head and put it out there for everyone else to see and become real. To me, the best way to actually start my new projects is simply... to tell everyone that I'm going to start them. So there you go. Make it public. Get it out of your head and start talking to people about it. Make those first pictures and show them. This is the moment the lingering stops. The moment my great-grandparents tell me: good, at least you're doing something now. And it's also the moment that the ideas that will forever remain ideas, suddenly hide and stay inside my head, while the "possible" ones come out and maybe become reality. You know that feeling when for the very first time you talk to someone else about a new project? And while you're talking you instantly feel that, no matter how much you thought it through, there are holes and illogical things all over the place. You feel nervous and scared and almost ashamed laying out that little seedling of an idea.... it seems like your confidence is gone all over again... you stutter. But doing this is so necessary for me. I feel that an idea can only be really put to the test through dialogue with others. I need to do this with people who understand what you’re doing, yet at the same time are not too personally involved. And I need to do this repeatedly. It’s like I have to have a secret group of human touchstones to talk about different aspects an idea. Some people don’t have anything to do with photography... others are seasoned pros... mentors... and mother of course... and some who do not even know they are giving me advice in the first place. It’s all meant to happen naturally. And after a certain time, when the feedback has sufficient mass, I'll stop being scared and slowly start to believe the project might be possible. I'll be able to voice my idea eloquently. This is the moment when I start believing that the idea can be "possible"... From then on, considerations become more practical and real and that's when I hope everything hopefully will be able to fit within my daily life and duties and existing projects... Like anyone, I don't live in a bubble, however attractive that would seem. I know, it seems impossible to start all these in one go... it would be like an explosion... some projects are light and full of life, some are extremely dark and heavy and full of death... but I'm in no rush... we'll see what works out. One by one, slowly....... I for one am SO super excited. Looks like a photographic new year's resolution in a way... smiling... and hoping I'll be at least able to start the massive and incomprehensible "heavens"... that's the one to look out for. Bon Iver playing Perth now. Today is exactly 1000 days ago that BURN Magazine published my first image of YAKUZA... and what an adventure that was to become. I must say I had no clue. These past two months have been great. Humbling also. More than anything else, I'm incredibly grateful for all the attention YAKUZA gets everywhere... Many good things have happened and I'm hoping many more good things will come. And it started all on BURN magazine with David Alan Harvey as my mentor... I literally owe you everything, amigo. And then came the press attention... attention and support which, without fault, has been super professional and incredibly heartwarming... GEO, GEO Epoche, The Sunday Times, El Pais, BBC, BBC Radio 4, BBC Mundo, Dagens Næringsliv, Blurb, The Japan Times, Chasseur D'Images, Rencontres d'Arles,... so many, and there's still more to come (stay tuned!). I'm genuinely happy and excited... And I realize all the above is giving me an opportunity to reach more people with a book than ever before, tell my story to a wider audience... participate. So here's the plan: I literally just called the printer five minutes ago. Said it felt like it was time for a second edition. The price of this second edition? Also exactly the same. I want the first edition buyers to know that they have something special, but that they did not have to pay a premium price for this. That "extra" in the first edition is my token of appreciation for the trust they gave me. Again... thank you so much for the hundreds of supportive emails... and asking for a second edition. I heed your call. as of Nov 1, 2013, the second edition is sold out. The book is only available at exhibitions and possibly select book stores. I never thought it would go this way. I expected to sell about half of what I printed, ever. Instead, the book ODO YAKUZA TOKYO opened on BURN on June 17, and now, 34 days later, the 500 copy limited edition is sold out... If you have any enquiries about this edition, just send me a direct email. 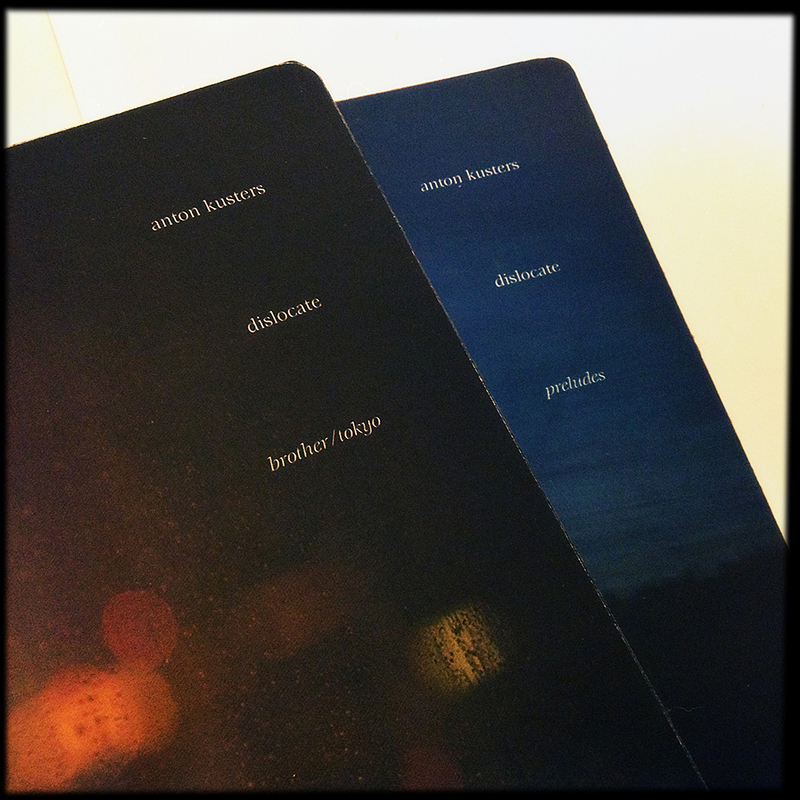 Today I'm wrapping the final book to ship. It does feel kind of sentimental. Completely honored, and grateful to the chance I've been given, I now need a rest. Just a short one. One week. I'll be going on a little road trip with my lover, and after that, spend August at home, recharging, taking things easy, making my mind empty... and planting some seeds. Thank you all who bought the book, it has been a life-changing positive experience. I hope I will be granted many more of these. exciting day... no words needed... just some snaps.